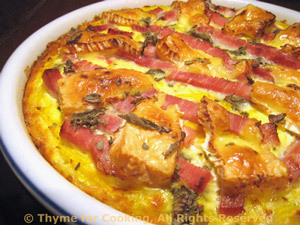 Butternut Squash, Ham, Brie Quiche, Thyme for Cooking autumn gourmet tart. Cut ham into strips and cheese into slices. Shred the squash using the large holes on a grater. Spread squash evenly over the crust. Lay the ham on the squash and the cheese on the ham. Sprinkle the sage over all. Bake for 30 minutes, until center has just set.